For the third release The Zone Records choices only italian artists from the special and beautiful land Sardinia. 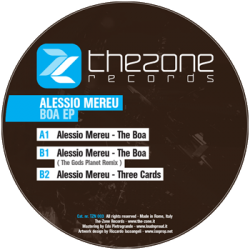 The release’s artist is the big Alessio Mereu, he is young but his productions are played and supported for years by big names in the world as Adam Beyer, Paco Osuna, Richie Hawtin, Sven Vath, Alex Under, The Advent, Alexi Delano, Xpansul and many more. In the two Alessio’s tracks (“The Boa” and “Three Cards”) the Detroit techno mixes perfectly with the German techno… the sound is hypnotic, haunting and full of rhythmic groove… music seems to come from the old tribes. There is also a very good “The Boa” remix of young artist but well established in Europe, Claudio PRC and Ness with the new project called The Gods Planet, it’s a real bomb for the dancefloor… for sure will be an HIT!